Darkness enveloped the mountain like a brass mute, subduing a vibrant symphony of colors into a blue and gray requiem. I was in desperate need of a boost, struggling to climb out of a deep (and yes, predictable) mile-fifty bonk while simultaneously climbing a five-mile, 3,000-foot ascent through a narrow canyon. They call this place Blind Hollow. My headlamp beam cast flat light on the trail, adding poor visibility to significantly reduced muscle power. My body was no match for this staircase of camouflaged rocks, and I frequently stubbed my toes, stumbled and swore. It wasn't a good sign that I was hurting and tripping this much while climbing. Descents are my weakness. Climbs I can do, usually — but as my climbing ability diminishes, so goes my chances of finishing the Bear 100. Music is something I lean on a lot in endurance challenges. I don't even care if people think it's a crutch. My trekking poles are a crutch, and I love those, too. I had the Monsters and Men album "My Head is an Animal" on repeat through long low points during the Stagecoach 400 bike race last April, and it seemed to help, so I flipped through my iPod until I found it. But after three songs of mellow indie folk, I only felt more melancholy. I needed motivating pop music, and remembered that Florence and the Machine boosted me through healthy segments of UTMB training. So I switched to that. This section of the Bear 100 course was still new to me, the unknown first half. Although I'd never been here before, I felt a connection to this place, a familiar warmth coursing through my veins. When aid station volunteers asked me where I was from, I'd made of habit of noting that while I lived in California, "My dad's family came from here. I have a great-great-and-so-forth grandfather who was a Mormon pioneer and was one of the first settlers in the Cache Valley." My grandmother has always been proud of the family's pioneer heritage and tried to instill in her grandkids a healthy respect for our roots. Our ancestor was so poor that he and his family didn't have shoes to wear in the winter or enough food to eat in the summer. They crossed middle America with almost nothing and went on to build a town that had grown into the large community that was only a few miles from here. Fifty miles, actually, by Bear 100 trail. I looked at my watch and groaned. I was still so, so far from the finish line. 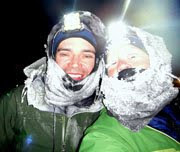 And yet there was so much to look forward to — meeting my friend Danni at the next aid station, having her join me for an overnight slumber-party-on-foot, visiting the spot where I met Beat for our first date, seeing the moonlit mountainsides where he and I first connected. I needed to tap some of my great-great-and-so-forth grandfather's pioneering determination. If a guy with no shoes and no money can cross a thousand miles of empty Plains, I can certainly rally for fifty more miles of a well-supported recreational race. Florence and the Machine did add some rhythm to my plodding steps. I stuffed fruit snacks in my mouth and started glancing away from the trail since my headlight had no definition anyway. A ethereal silver glow outlined the edges of aspen leaves. I squinted at what I assumed was an optical illusion and realized that the light was reflecting from the full moon, rising over the tips of the trees. A harvest moon. The night was chilly, close to freezing already at 8,000 feet, and I could taste the sweet decay of autumn amid clouds of my own breath. The oxygen-starved air seemed to be filled with tiny ice shards, searing my lungs. After a seeming lifetime of hunched climbing and sickening-but-necessary fruit snacks, I crested an open meadow illuminated by the moon. Sagebrush sparkled and the distant mountains were rendered with stark silver-and-black definition. It was like a photo negative, an inverted reflection of the eye-popping color that filled these mountains in the daytime — but equally sublime. Even though I was tired and sick, I felt a rush of joy. And because I was tired and sick, the contrasting emotion cut deeper than it ever could in times of comfort and complacency. The trail finally slanted downward, and I felt a strong urge to run. I am endlessly searching for things I can't even conceptualize until I find them. That in essence is the catalyst of my endurance hobby and wanderlust — journeys with unknown destinations. Yes, finishing the Bear 100 was important to me, but I knew what I was looking for wouldn't be found at the finish line. It was somewhere out here, amid these silver-tinted mountains in northern Utah, where old bloodlines ran deep but the air was sweet and new. And then I came to a familiar place — strikingly familiar, even when rendered like a photo negative. Granite cliffs encircled the glittering basin of Tony Grove Lake, lined by silver aspen trees. I remembered this place like I had been here just yesterday — the place Beat and I pursued in our own separate but difficult journeys two years ago, coincidentally arriving at Tony Grove just five minutes apart. The place where he looked at me with those eyes that pierced through all remnants of reason and sanity, and asked that simple but profound question: "So, are you running?" "Cause I am," I repeated out loud, and ran toward my friend Danni at the Tony Grove aid station. Beautiful post Jill. I had fun telling people about your people too and how you are genetically immune to suffering and hardship. Florence and the Machine always ends up on my running playlist no matter what (along with Gorillaz), it's hard not to move when I hear them. Great post and pics. We have a lot of beauty up here in the PNW, but nothing like those autumn leaves. beautiful storytelling as always Jill! Love Danni's comment - true call :) favourite running tunes at the moment are coming from Pendulum and some of the new Presets, but I don't think they'd contribute near as much as Florence in the way of smooth narrative flow.